I’ve long enjoyed referring to Reading as “Zone 8”, and one of the most significant developments in Reading’s restaurant scene during my time away was this description becoming less and less of a joke. 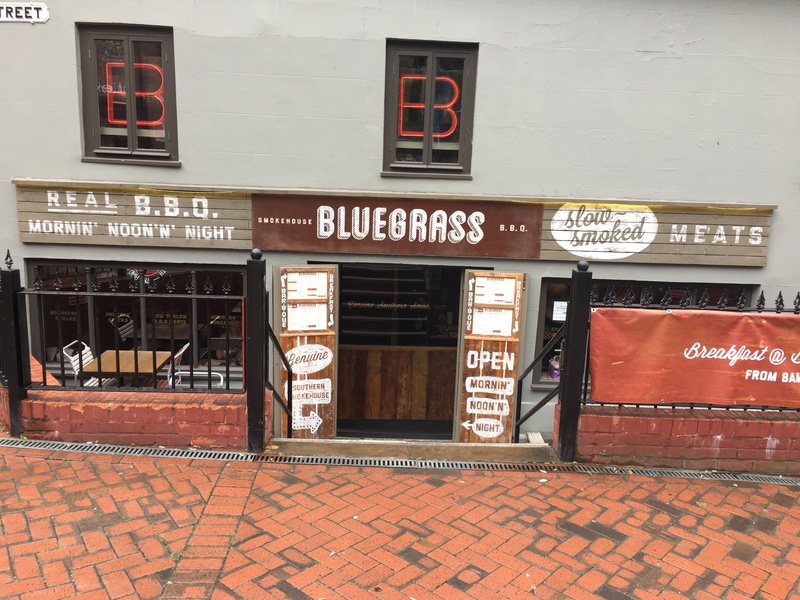 Reading’s always been a chain magnet, but the latest wave of new and imminent arrivals has a distinct whiff of the capital about it: The Real Greek, The Botanist and Comptoir Libanais are already here; Pho, Honest Burger and Byron are on their way. A big Pret has sprung up just opposite the train station, too: by the time Crossrail gets here, people might alight at Reading and be unaware that they’re not in Kansas (or possibly Camden) anymore. The one I was most excited about was the arrival of Franco Manca. For years I’ve been complaining that Reading could do with a really good pizzeria to rival the likes of Bosco in Bristol or The Hearth in Lewes. 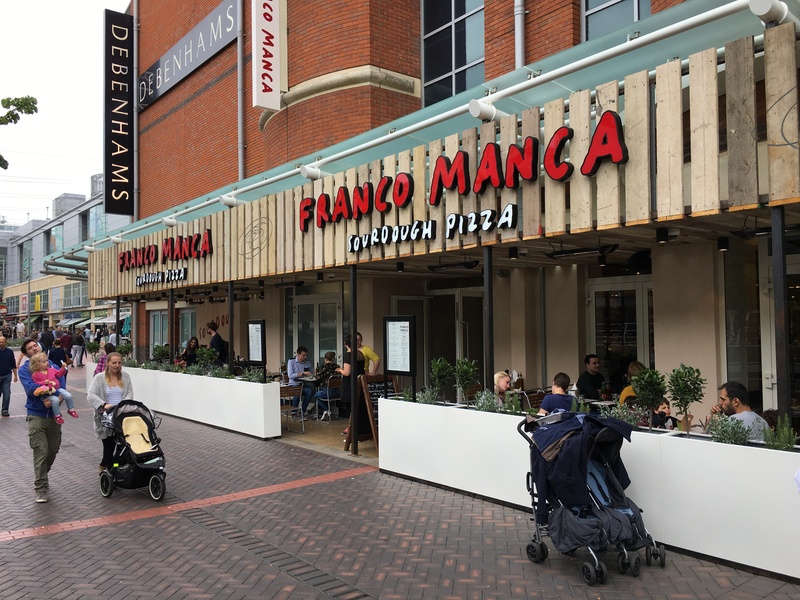 Then I discovered Papa Gee and found that I didn’t feel quite so deprived but even so, Franco Manca (along with the likes of Leon and Le Pain Quotidien) remained one of the chains I most wanted to see make it out west to Reading. 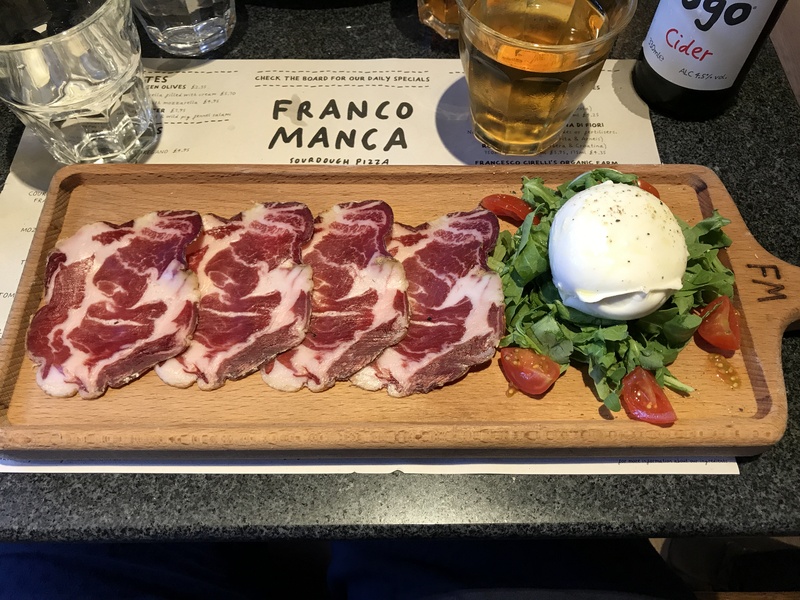 I’ve been going to Franco Manca, in Brixton and Battersea, for many years and I’ve always loved their sourdough pizzas, gorgeous burrata and short unfussy wine list. The space outside is nicely used and if the weather had been better I’d have been sorely tempted to eat in the sunshine, but I visited on an inclement weekday so I found myself waiting for a table to become available (in the spirit of another London trend coming our way, Franco Manca doesn’t take bookings). I managed to nab a table in the corner of the room, nearest the window, which gave me a good look at the room. It’s a big space: all square tables, wooden school-effect chairs and bare lightbulbs, the walls covered in what appeared to be upcycled pallets, no soft furnishings and nothing to absorb sound. What this means is that, even tucked away in a corner, the experience was a cacophonous one. I’d come to Franco Manca with my friend Tim and the whole evening was marked by both of us constantly having to lean across the table and say “What?” “Pardon?” or “I’m really sorry, but I’m going to have to ask you to repeat that. Again.” The irony: here we were in a room full of young chatty diners and I’m not sure I’ve ever felt more geriatric. It’s the first time I’ve seriously considered taking an ear trumpet to a restaurant (although, depressingly, I doubt it will be the last). The menu is a short one – a small range of starters (or “Bites”) and seven pizzas, two without a tomato base. The specials board lists some extra starters, two special pizzas – one meat, one vegetarian – and an array of extra toppings. I was a bit confused by the flip side of the menu which talks about all of Franco Manca’s ingredients but doesn’t make it clear whether you can order those as extra toppings or not, but maybe I’m just getting old and finding hidden complications in a very simple menu (an unwelcome theme is emerging here: have you noticed?). While we waited for our order to arrive, Tim and I enjoyed something from the compact and bijou drinks list. There are a handful of wines, two beers and one cider (described as “No Logo”, presumably a tribute to Naomi Klein’s late 90s anti-consumerist classic). I had the cider, which was pleasant – sparkling and cold but with a slightly agricultural hint. The waiter brought it over without a glass and I had to ask him to come back with one, but not before my request was met with a slightly vacant look. Perhaps all the hip gunslingers drink straight from the bottle (and, for that matter, can understand every word spoken by the person opposite them). Tim, last seen on this blog enduring the culinary Vietnam of a trip to Cosmo, is a Beer Expert. He has forgotten more about beer than I’ve ever known (although that’s not saying a lot: he probably forgets more about beer in a single day than I’ve learned in a lifetime). So I’m well used to him putting on his Serious Beer Tasting Face, taking a sip, knotting his eyebrows, smacking his lips afterwards and pronouncing it “okay, I suppose”, as he did here. “Of course, they say it’s no logo but it’s by Shepherd Neame”, he added. “It might go better with the food, to be fair.” I nodded sagely, pretending to understand what he was talking about – a look I’ve perfected over many evenings spent hearing Tim wax lyrical about the Citra hop (whatever that is: I thought it was a dance from the Twenties, but apparently not). My starter was uncomplicated and delicious, a wooden board with four thick, generous slices of coppa and a ball of mozzarella perched on some salad. I yield to nobody in my love of mozzarella served before it’s been ruined by heat – so cold, clean and fresh-tasting! – and this was a pretty joyous example. I also love coppa, beautifully marbled pork shoulder which I’ve always found more interesting than Parma ham (how I miss the days when you could buy it from the deli counter at Carluccio’s). Again, this one was damned fine. And you could quibble about how this was a triumph of buying or assembly rather than of cooking if you really were so minded, but to me it was a triumph of eating, which is far more important. Decent value at six pounds, too. “Well I’m not now.” I said; later I looked back, and it appears that I do indeed always say that. Tim was faced with something altogether more baffling. The specials board had described it as “Gloucester old spot baked sausage”, which could potentially give you the impression that what turned up might resemble, you know, sausages. But the use of the singular, with hindsight, was a clue. Instead, what Tim got was a slab of sausage meat that had been baked with a tomato sauce and dolloped with what might have been crème fraiche. The sausage meat was lovely – coarse and shot through, I think, with a smidge of fennel. But it was an odd dish and I’m not sure Tim would have ordered it if it had been more accurately described (perhaps as middle class sausage McMuffin only without the muffin, or Millennial meatloaf). Half the fun of sausages is the contrast in texture between outside and inside (I like mine like mummified fingers, personally) and that was missing here. Tim looked enviously at my starter, and I gave him some coppa and mozzarella to apologise for ordering better than him. If anything, I think it made matters worse. The pizzas took longer to arrive than I expected, which was no bad thing although it was characterised by a bit more ineffectual service. 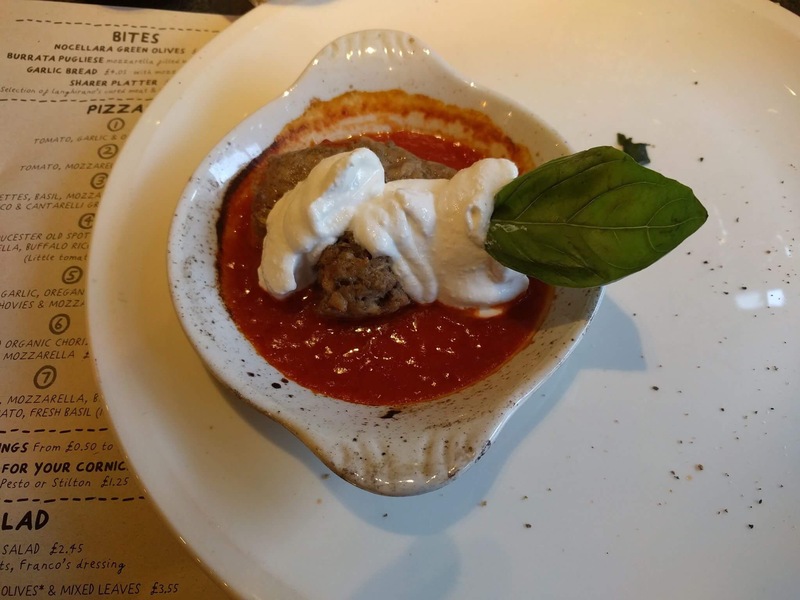 I’d ordered a dip for my crust (or “cornicione” as the Franco Manca menu likes to call it) and there was some general chaos about which one I’d gone for – pesto, since you asked – which even led to the manager having to come over and ask me what I’d ordered. She was quite brilliant, bright and personable – but if anything, that just highlighted that the rest of the service had been a bit… well… I’m struggling to find a more appropriate word than “gormless”, so let’s just leave that there. If I won the battle of the starters, I think Tim did better on pizza. His was a pretty classic combination – tomato sauce, mozzarella, and (according to the menu) both dry and semi-dry chorizo. And it looked good, although I did have some reservations; maybe I’m just greedy but it felt a little light on chorizo and what chorizo there was was so unevenly distributed that it looked like it had been dropped onto the pizza from a great height by someone with their eyes shut. Again, I wondered if I just wasn’t cut out for this new devil-may-care attitude and perhaps literally nobody else would be bothered by this. What can’t be denied, though, is that it was tasty: the crust was bubbled, blistered and light, the base top notch. “Can you tell the difference between the two types of chorizo?” I said to Tim as he hoovered up his final mouthful. My pizza, by contrast, just didn’t work. I went for one without a tomato sauce base and instead it came with yellow tomatoes, buffalo ricotta and spicy lamb sausage. It looked unbalanced to me when they put it down in front of me and it tasted unbalanced too: the tomatoes were sweet, the ricotta was sweet and although the sausage – something a bit like merguez – was genuinely fiery and delicious there just wasn’t enough of it to counteract everything else. Again, everything looked assembled at random and in this case it made for quite an unattractive pizza, with the sausage unpleasantly reminiscent of droppings and the ricotta looking disconcertingly like cuckoo spit (hungry yet?). The pesto dip was an excellent idea but in execution it just lacked enough salt and parmesan to offset the oil. On a previous trip to Franco Manco just after it opened I had been absolutely enchanted by a lemon and rosemary cake with Greek yoghurt and honey, which has to be one of the nicest things I’ve eaten this year. I tell you this because, in keeping with the rest of the evening, they had taken it off the menu for this visit. So we skipped dessert, cut our losses, paid up and beetled off to the pub. The bill came to just under forty-two pounds for two, without tip. Both pizzas, and this will give you a clue as to Franco Manca’s popularity, clocked in at around eight pounds. When I go for dinner on duty with a companion, I like to play little game at the end. We text our rating out of 10 to each other simultaneously, like some kind of digital gunfight, and compare notes. Tim’s rating was nothing special: he wasn’t impressed with Franco Manca. He said the food was good but not good enough to overcome the room and the service. He’d sooner go to Papa Gee, he said, and of course I felt a little bit proud of him for that. It quite outweighed his shortcomings when it came to describing chorizo, which after all is a niche skill in anybody’s book. It might surprise you, based on everything that’s gone before, that I feel a little more kindly disposed to Franco Manco than Tim was. Restaurants are good at different things, and some restaurants can be good despite excelling at something which isn’t necessarily my thing. 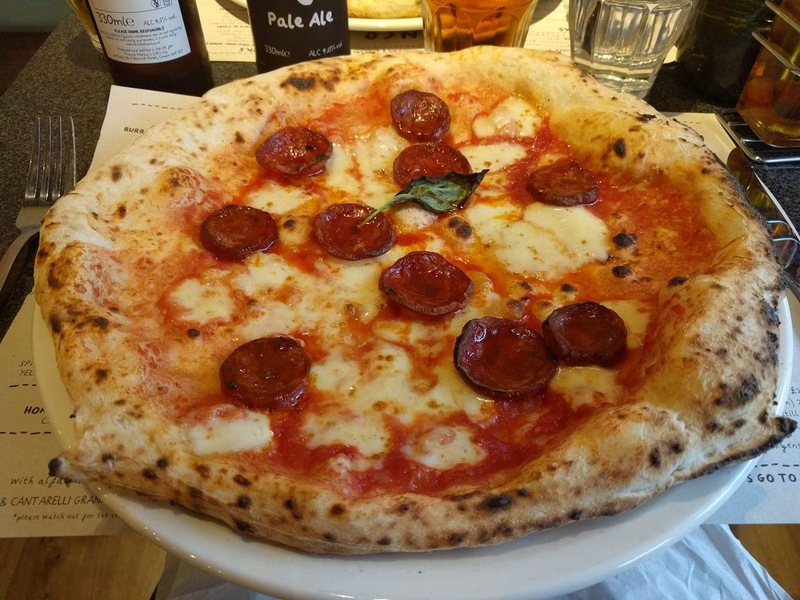 And there is a lot to be said for Franco Manca if you’re grabbing a quick meal in the centre of town, or you’re on a budget, or if you really like pizza. Or if you’re considerably younger than me (many people are, these days), wear a snapback indoors and don’t mind raising your voice to have even a rudimentary conversation with your mates. Or, now I come to think of it, if you want to eat somewhere good in the Oracle which isn’t Cote. The pizza, as long as you pick the right one, is good enough to overcome a multitude of sins, and next time I go I’ll stick to the tried and tested classic of anchovies, olives, capers and basil. Personally, I can see myself heading there at lunchtime on a sunny day, or having an early dinner there before ambling off to the cinema or Tuesday Music Club at the Global Cafe, full and happy, ear trumpet stowed away in my satchel. Last week I took part in a live Q&A on Twitter about the Reading Fringe. It’s an amazing Reading institution, now in its fifth year and bigger than ever with 72 shows running across 14 venues over 5 days. I was more than happy to support it by answering questions for an hour; obviously some people wanted answers to the burning questions of the day (my favourite flavour is salt and vinegar, thanks for asking) but the best question I got asked was this – where should I eat before going to take in a show at the Fringe? It’s an excellent question, and I dashed off a few quick responses, but the more I thought about it the more I thought it might make a useful feature for those of you attending a cultural event in Reading for the rest of this week. So here goes! Many of these shows start at 7 or 7.30, so you need to find somewhere nearby that serves decent food and can feed you and have you out the door sharpish. 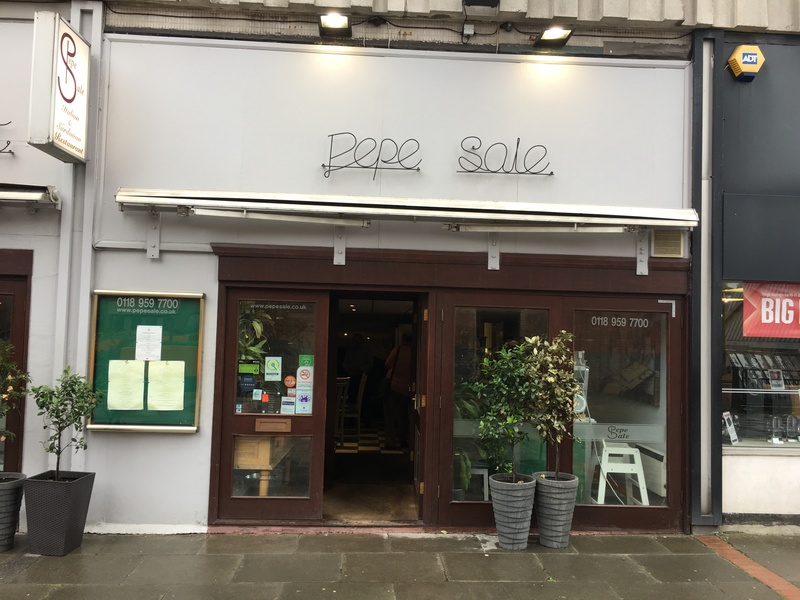 Pepe Sale, as a restaurant right next to the Hexagon, has an impeccable pedigree of doing this so is well worth considering. It’s not the most attractive interior in the world but you probably won’t have the time to fully appreciate that, especially if you’re concentrating on the food. If you’re in a rush the pasta dishes are always a good bet (I’m a particular fan of the tagliolini with smoked salmon, saffron and cream). Failing that, Bluegrass is another excellent option and has the additional benefit that you pay up front so it’s easy to scarper afterwards without having to flag someone down to settle the bill. When I first went it was all about pulled pork and brisket but the menu definitely has other interesting choices including the Southern fried chicken and most notably the slow cooked beef brisket chilli – watermelon slices and all – which has become my go-to dish there. Lastly, Bhoj is in its new home a couple of doors down from Pepe Sale and does some of Reading’s finest Indian food. Karahi lamb is my favourite choice here, although ordering from here prior to a packed performance might not be the most sociable thing you could do. Oh, and don’t go to Smokin’ Billy’s to eat. You’d be better off grabbing a Pizza Express and eating it in the garden of the Allied Arms. 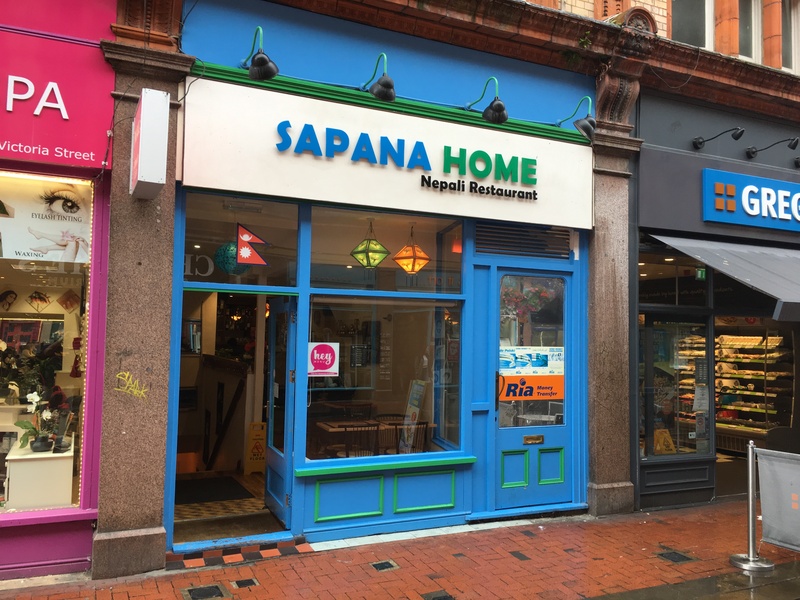 Sapana Home is still often my choice for a quick town centre meal and it’s a great place for pre-theatre because if you get there bang on six o’clock you’re likely to eat brilliantly and still make your show. I’ve written about the place so many times that I’m in danger of getting repetitive, but really, have any of the pan fried chicken momo, the samosa chaat, the chicken fry and the chow mein and you’ll have an absolutely fantastic meal. Sapana was my restaurant of the year last year and is still a favourite of mine. Surprisingly good for kids, too: my friend’s 10 year old son is a massive fan of the momo and can manage all 10 in a single sitting. Attaboy. Some of the shows at the Dome are mid-afternoon and for those Shed and Kokoro offer good lunch options. Shed is great for kids, if you’re going to one of the kids’ shows there, and does a great array of sandwiches and salads (and the Top One – chorizo and cheese and jalapeno – remains one of the best sandwiches you can eat in the ‘Ding). Kokoro is newer, an offshoot of a small chain, and goes fantastic tubs of crispy chilli chicken or spicy thigh meat curries with rice or noodles or a range of sushi. Only a few tables, but again perfect for a quick meal where you rush in and out. You can judge all you like, but I also have a soft spot for the Nando’s on Friar Street. Butterflied chicken breast, medium, with spicy rice and macho peas (or corn on the cob if you absolutely must) and garlic piri-piri on the side. Have a spot of sangria while you’re at it, because I always find it makes me far more artistically receptive: after a whole jug I’ve even been known to enjoy an episode of Sherlock. Oh, and don’t go to Cosmo. Duck in a Yorkshire pudding is all well and good, but your digestive system will pay a terrible price the next day. The Oracle is not my favourite place to eat, and there’s only one show here (live music at 12 and 3 from Lisa Zimmerman who has the tough gig of interesting Oracle shoppers in German opera with a pop twist: good luck with that, Lisa) but even here you can have a decent quick bite to eat. If you’re keeping it old school you could do a lot worse than a burrito from Mission with black beans, shredded slow-cooked beef, salad, guacamole and smoky chipotle sauce. 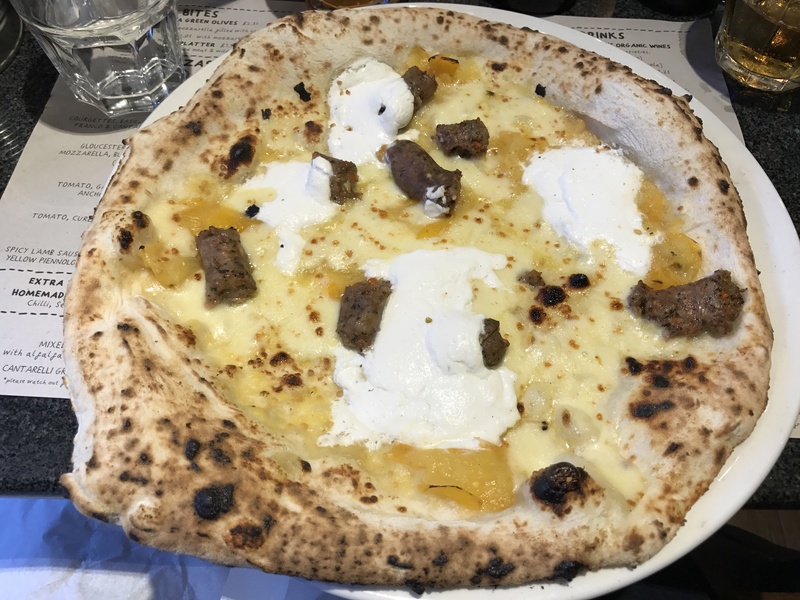 But if you want to try one of the newcomers, Franco Manca does very good sourdough pizzas with splendid crusts that are cooked quickly in the blisteringly hot oven. Try and keep enough time back for the rosemary cake with Greek yoghurt, you won’t regret it. The easiest choices of all, these: round this part of town Bakery House is almost the only show in town. My last meal there was a little disappointing but it’s the only bad meal I’ve ever had there and I still have faith in them to deliver gorgeous Lebanese food quickly in a nice unpretentious setting. If you’re in a hurry for a show you might be better off ordering plenty of small dishes to share in which case the rich glossy houmous topped with pieces of roasted lamb, the amazing falafel, the little succulent maqaneq sausages and the halloumi stuffed pitta bread are all worth a go. And if you have a little bit longer I only have three beautiful words to say to you: boneless baby chicken. I reviewed the Lyndhurst recently and it’s the perfect spot for a show in that area, especially if you’re watching something at South Street. 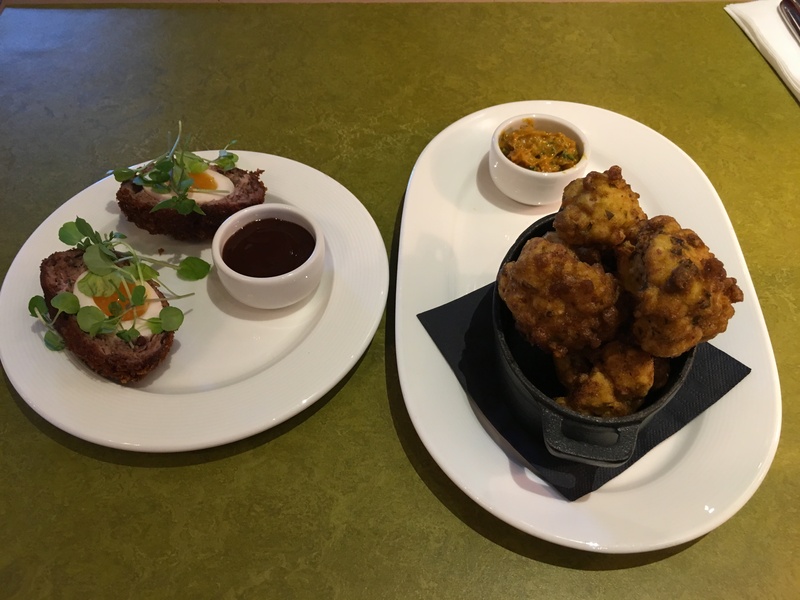 The menu changes too regularly for me to be able to make too many recommendations but you can’t go far wrong and at the very least you should consider the pink pickled eggs (the distinctive colour coming from beetroot) with a hint of star anise, the Scotch egg or the dead good fish and chips. Anyway, I hope this is useful and that you seriously consider taking in a show over the next week or so, whether it’s stand-up, gig theatre, experimental theatre, music, chap-hop or (because Britain’s Got Talent suggests at least some people like this sort of thing) dance. The Fringe’s website is here, and tickets can still be bought in advance for the majority of the shows. Maybe I’ll see you at something: I fancy going to watch All We Ever Wanted Was Everything, and I might go get squiffy at the launch party tomorrow night. I’ll be the one in the Mexican wrestling mask. You weren’t meant to be getting a review of The Three Guineas this week. My companion for this week’s review was my friend Izzy, a veritable girl around town who I’ve known for yonks, and when I gave her a free choice of all the establishments on my to do list she went – rather to my surprise, to be honest – for the Crown On The Bridge, the pub on the edge of Caversham which has recently relaunched with a menu largely revolving around hot dogs and bangers and mash. Despite this being a quixotic choice in the middle of a summer as hot as balls, I was happy with it. I figured I could meet up with Izzy, hear stories of her latest exploits on Tinder or Bumble (although based on her recent experiences I think she may have accidentally merged them into a single app called Tumble populated exclusively by a freakish parade of emotionally stunted men) and work in a few jokes about Izzy going on a sausage hunt. Really, it was too perfect: she could be Carrie Bradshaw, we’d have a good old gas and I’d get a review into the bargain (I’ll leave you to guess whether I’m more like Miranda, Samantha or indeed Stanford Blatch). The day before the review, disaster struck: Izzy had had a good week at Weight Watchers and unlike most people, who would fall on a plate of sausages like a hungry beast to celebrate, this meant she wanted to be Sensible. Could we go to The Three Guineas instead, she asked? It has a very tempting looking poached salmon and vegetable dish. Leaving out the fact that, in my book at least, there’s no such thing, I agreed immediately. Are you pissed off with me? she asked. Of course not I replied, mildly pissed off. She knows me well enough to know I was fibbing. When they first announced that The Three Guineas had protected status as part of the project to build the new station I was surprised. I’d always thought of it as a pretty skanky pub – with a handsome exterior, admittedly, but still not one deserving special treatment. I turned up on a warm day to review it and there were people at most of the tables outside soaking up the sunshine and drinking something fizzy and yellow (so, in that respect at least, very much like its previous incarnation). But going inside it was clear that the refurb had been done very nicely indeed – the pub was broken up into sections, each with a slightly different feel, but done in a way where nothing was jarring. 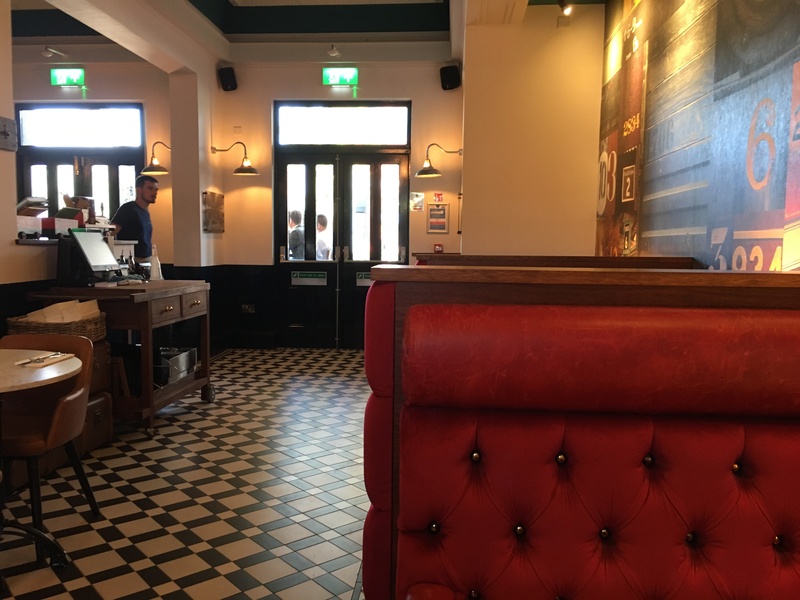 I especially liked the upper area with a tiled floor and stools, reminiscent of a railway brasserie somewhere much more glamorous and continental, and the dining area with its fetching deep red button-backed booths. I installed myself there, because it seemed to be the main part of the pub which did table service. To my relief when Izzy came in, resplendent in hipster glasses and a ironically retro Fleetwood Mac t-shirt, she announced that she had eaten very little all day and was keen to make up for lost calories. I was far too pleased by this to say anything petulant about sausages (although I can’t say it didn’t cross my mind) so I bit my tongue and we scoured the menu to try and figure out how to best attack it. I must say, I found the menu a bit uninspired, especially the main courses. It had the name of the pub’s head chef on it, but I’m not really sure why because I didn’t see much there – fish and chips, shepherd’s pie, burger, curry – that showed any signs of identity, personality or distinctiveness. More interesting was the array of nibbles around the four pound mark, which I assumed were small plates slightly smaller than a conventional starter. That was my excuse for us ordering three of them to share, and I’m sticking to it. Cauliflower pakora was probably the nicest of the nibbles we ordered – beautifully cooked florets, still with a little bite, and a light and crunchy batter. In a theme that was to continue all evening, however, it wasn’t quite what you’d expect it to be from the menu. Instead of many small florets these were big old buggers, and the “almond coronation mayonnaise” they came with was more like a curry dip. As so often with these things, there wasn’t quite enough of it. Less successful, although still very tasty, was the black pudding Scotch Egg. 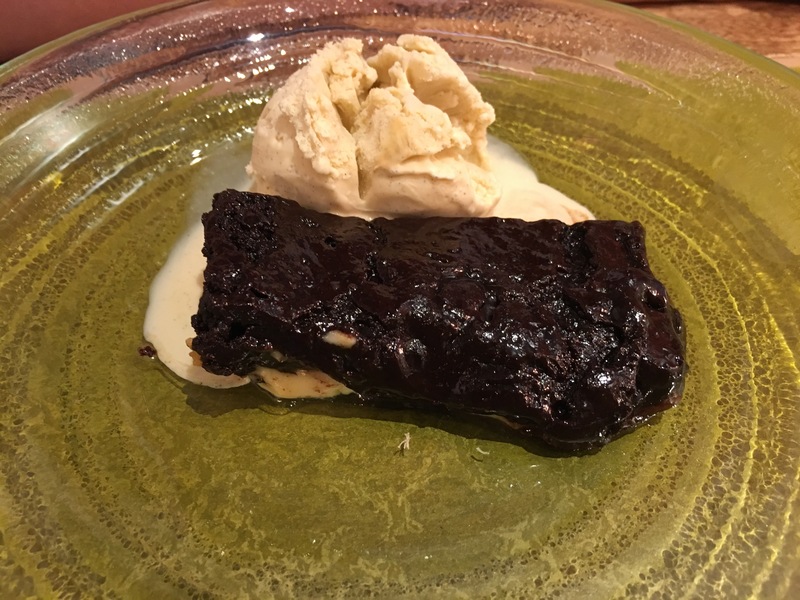 “Not as good as the Lyndhurst’s” was Izzy’s verdict and I had to agree – it wasn’t at all bad but it was decidedly subtle, especially where the black pudding was concerned (I found it almost undetectable). Most surreally, the “popcorn chicken” was nothing of the kind. I was expecting an upmarket take on KFC and what I got instead was tasty, coated and seasoned pieces of chicken but with absolutely nothing about them that would make you think “popcorn”. They came with a mayonnaise which was meant to have tarragon in it, but I think the tarragon had gone the way of the popcorn. Lots of quibbles there, but oddly I really enjoyed all the small plates despite the missteps and false advertising. The worst thing about them, though, was how much they made me look forward to the main courses, because that turned out to be the biggest piece of false advertising of all. My main course sounded amazing on paper: “braised West Country shoulder shepherd’s pie”. It stood out on the menu, begging to be ordered, and the least I could do was oblige. What turned up, though, went past mediocre to verge on insulting. The ratio of filling to topping in a dish is a debate people could have all day. It can be dish dependent, too: if you gave me a rhubarb crumble that wasn’t at least fifty per cent topping, I’d be most disappointed. 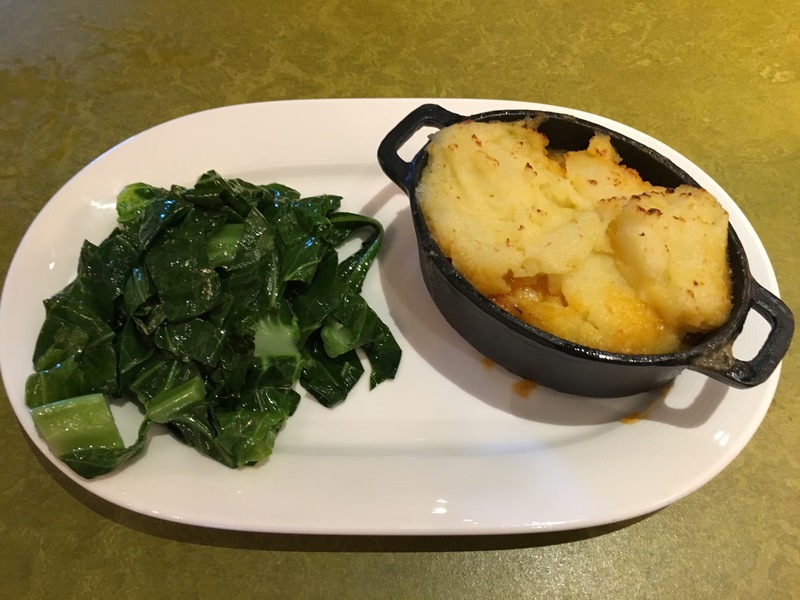 But, whichever way you want to look at it, a shepherd’s pie which is eighty per cent mashed potato isn’t going to impress anybody in their right mind. Surely this isn’t just me? I didn’t realise this at first, so I kept taking forkfuls of the mash hoping to hit lamby paydirt, but lamby paydirt never came. When I finally scraped the bottom, literally and metaphorically, it was a thin layer of lamb bulked out with diced carrots which tasted of very little. The spring greens which came on the side were sorry, thin, lukewarm things. Izzy’s menu said that this came with red wine gravy, my menu didn’t: the kitchen clearly had my menu rather than hers. The whole thing cost fourteen pounds and had me ruefully remembering the kind of food that money got you in the Lyndhurst. Instead I had mash, cold cabbage, a few cubes of carrot, some strands of lamb and the unshakeable feeling that they’d seen me coming. They do a better shepherd’s pie in M&S for a fiver. I found myself wishing I’d ordered the poached salmon, and that’s a profoundly sorry state of affairs. Izzy, after all that, went for the sweet potato, chickpea and spinach curry. 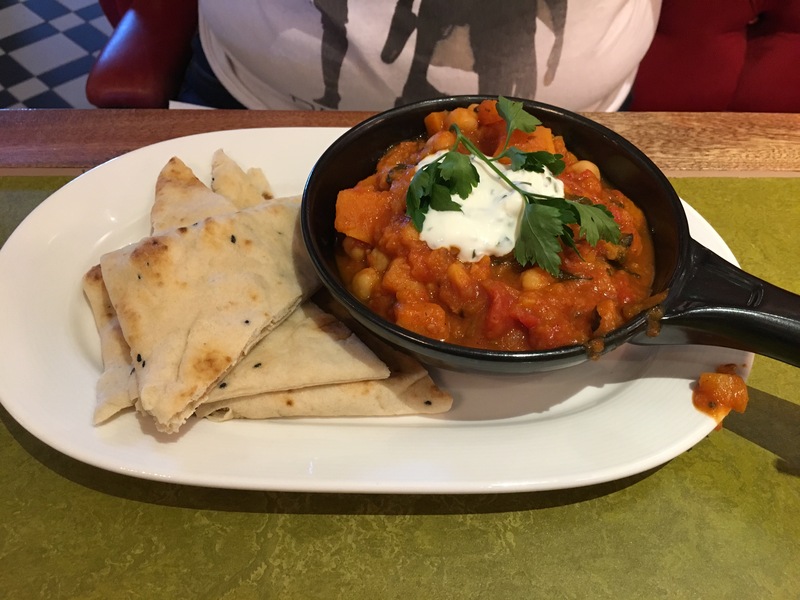 It came with flat dippable naans and was topped with a splodge of raita. I tried it and didn’t mind it but it was hard to get excited. It tasted of the sweetness of mango chutney more than the heat of spice, and although I quite enjoyed my mouthful I wouldn’t have wanted to wade through a whole portion of the stuff. Was it better than something you could pick up in a Wetherspoon’s? I doubted it, somehow. Izzy liked it though, at least up to the point where I leaned over conspiratorially and said to her “I’m never happier than when a chickpea’s in my mouth”. That got a grimace, and no doubt a mental note not to come out on duty with me again. Drinks, by the way, were pretty bog standard and inoffensive. I’ve read a fair few people complaining about the price of pints in the Three Guineas, but they have to recoup their outlay somehow and I fear it’s not long before Reading crosses the Londonesque Rubicon of five pounds a pint and never looks back (in fact, apparently the Thirsty Bear has beaten everybody else to it). I had a perfectly pleasant pint and a half of Cornish Orchard (four pounds eighty-five a pint, in case that makes you wince) and Izzy had a Hendricks and tonic followed by a Diet Pepsi. She specifically asked for cucumber in her G&T and when it arrived the cucumber was a few wispy strands which had presumably gone through a spiralizer. The overall effect was more like algae: truly random stuff. Service for the first half of our meal was from a young chap who seemed genuinely terrified every time he approached our table. I don’t know if it was his first day, or if he was worried about dropping something – an understandable concern based on how he tried to clear our starter plates away. Maybe he was just struggling to look Izzy in the eye: I’m told some gents find this on the difficult side. For the second half of the meal though our waitress was fantastic – likeable, enthusiastic and engaging, a proper people person (“it’s so nice to look after dining customers”, she told us, “because otherwise I just end up going from table to table picking up empty glasses”). She managed to talk us into ordering dessert too, although this gave The Three Guineas another opportunity to prove that the only consistent thing about them was their inconsistency. Izzy ordered the chocolate brownie with vanilla ice cream. Now, I have a problem with this because I’ve always thought it’s a cake rather than a dessert. It might be that the kitchen at the Three Guineas agrees with me, because what turned up couldn’t really be described as a cake. It lacked the essential – to me, anyway – characteristic of having been – what’s the word? – baked. Instead what turned up was a vaguely rectangular wobbling slab of cake mix. If they’d tried harder it would have been a brownie, but then if I’d tried harder I wouldn’t have got a C in GCSE drama; you’ve got to stop making excuses eventually. “It’s very nice”, said Izzy, “but it’s just goo”. My ice cream was three scoops, but the one on top was significantly smaller than the other two, like they’d given up partway through: if I’d taken the same approach as the kitchen, this review would abruptly stop here. Again, it’s a real pity because the ice cream was fantastic. It’s from Laverstoke Park Farm and had all the rich silkiness I associate with them – based, admittedly, on many a happy afternoon spent devouring their buffalo mozzarella. I loved the chocolate (what there was of it), I adored the salted caramel and I admired more than enjoyed the orange chocolate chip. But overall the ice cream was even nicer, I would say, than Tutti Frutti – especially in terms of texture. Even then, it rankled that the portion control was so haphazard and, even more oddly, when the bill arrived they’d decided to charge separately for each scoop, making it more expensive. The whole meal came to £64, not including tip. As Izzy and I strolled across Forbury Gardens, heading to the Retreat for a post-meal debrief, we chatted about the meal. Probably is about right, I think. I could see myself stopping there with friends for drinks, or popping in off the train and just wolfing down some of those small dishes. But I keep coming back to the mistakes, and god knows there were plenty. A shepherd’s pie which could almost have been made without the involvement of a single shepherd. A brownie which had never seen an oven. Cucumber like algae. Popcorn chicken which gave no clue as to how it got the name. I’m tempted to be generous to the Three Guineas because they’ve breathed life into a lovely old building, the interior looks great, and the service at the end was as good as any I’ve had in far more illustrious places. But then I think about the money sunk into the place, and the prime location they have and I think that the food, overall, was just lazy. I keep coming back to places like The Lyndhurst, which get this stuff right and put proper thought into their food. And The Lyndhurst is flourishing despite not having the luxury of a captive, transient and (let’s be honest) possibly inebriated clientele to rely on. Why would I go to The Three Guineas when I can go there? So all in all I can’t recommend The Three Guineas, and that’s a real shame. Unless and until they sort out their food, they’re going to be wasting one of their best assets clearing glasses from tables, and Reading will – in some respects at least – waste one of its most attractive buildings.